The spring bug has hit me. (Have I told you that Spring is my favorite time of year? Not autumn. Not summer. But spring. For spring, I just want light and airy and sweet and cheery. I found some darling jumbo ric-rac over at Ribbon Retreat +Fabric (found it here)…….and had to have it. Right away, I used it to add more spring to the girls’ wardrobe. There’s something about that jumbo ric-rac on that bright white fabric that wins me over. Ahhh. I made the skirt just like the adult version of the Lily skirt pattern found in my shop, here. Even little girls appreciate that nice and cozy smocked waistband. And in our house……….the more twirl, the better. 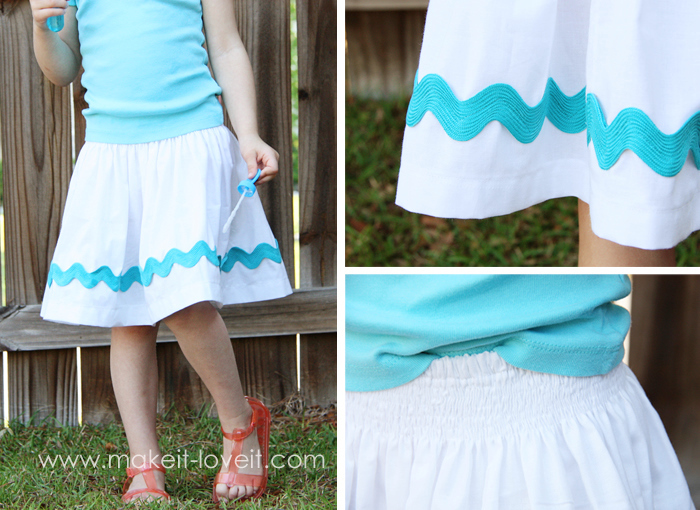 In case you’re wanting a child version of the Lily Skirt: I made the width of the skirt 3 times as wide as my daughter’s waist. I wanted it fuller than my ‘ol 2 times as wide general skirt making rule. But you can make it as full or flat as you’d like. Since her waist is 20 inches, I made my white piece of fabric 60 inches wide (or 2 pieces that are 30 inches wide)………and then made it about 14 inches tall (that included the seam allowance). Also, I didn’t make as many rows of smocking. But everything else is the same as the pattern from my shop. And the little dress was made with the Maddy Dress pattern found in my shop, here. The girls showing off their spring smiles. Everything is more cheery and alive with spring around. To attach the ric-rac (that I purchased here), you can pin it down and then sew along each side of the ric-rac……..or take a short cut like I did and sew a big zig-zag line down the center of the ric-rac. 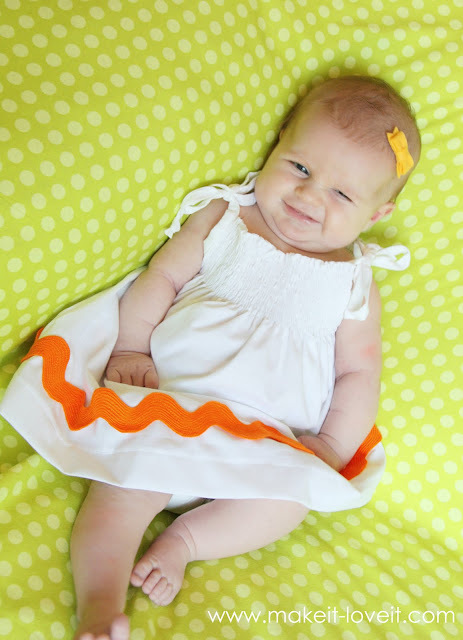 And you can use this ric-rac with printed fabrics, solid colored fabrics…….anything. I just had a vision of bright white cotton…….with some huge ric-rac trim along the bottom. 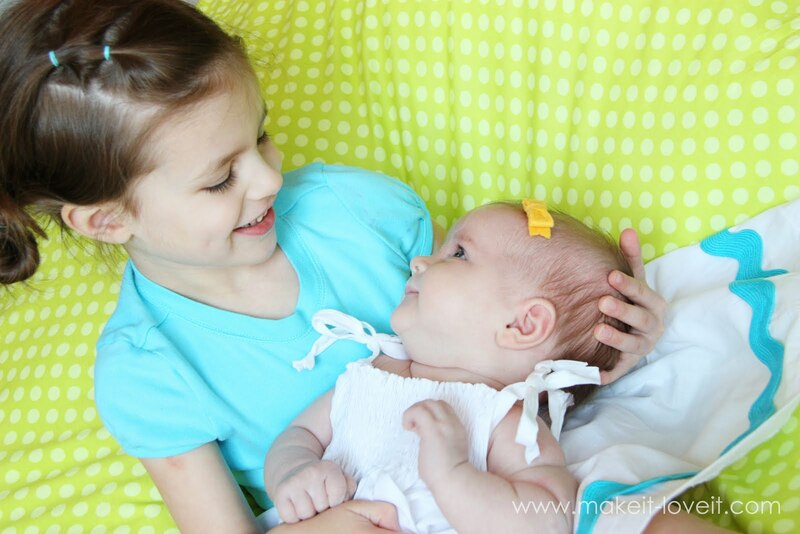 And love these two little beauties as well. so cute! I've always loved the extra big ric rac or the extra small. Too cute! You always make the cutest stuff. And, PLEASE! 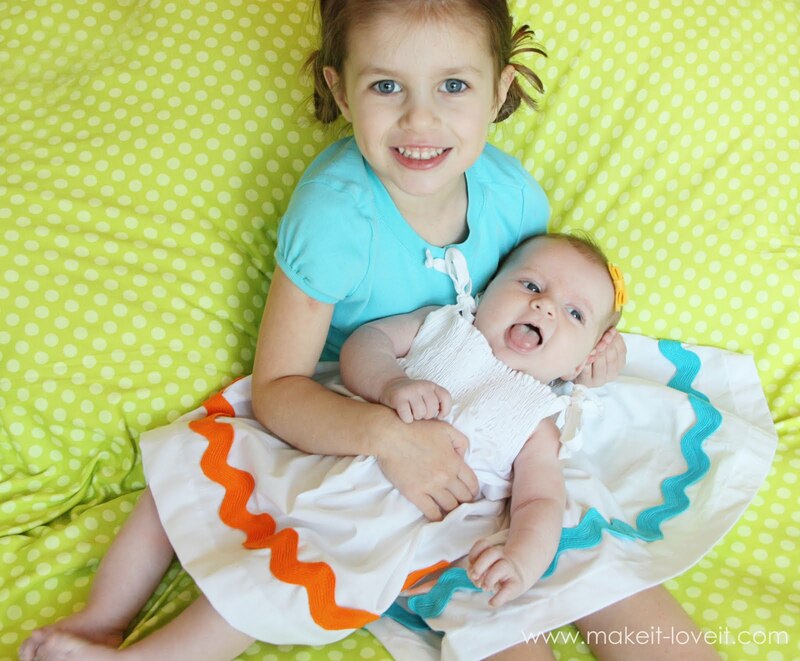 Share how you are finding the time to make all these wonderfully adorable things! I have a 3 year old and a 7 month old and things like this are taking me weeks to get done now! So adorable! I think I might have to make a skirt or two for myself for spring! Those are cute…the dresses too!! Ha-ha. I’m getting inspired for dresses for my sons wedding!! Love your older daughter's hair. Any tips on how to get that look? This is adorable. I've never seen ric rac that big. Love it! Is the ric rac the jumbo or mega size? Thanks! Love those! And that huge ric rac is awesome! Now you just need to make some ric rac flowers to match their dresses. They are so easy and cute! You have such adorable girls!! And I too want those white skirts with ric-rac – they look perfect for spring and summer! How do you get the bows to stay in her hair? I love this Easter outfits! The color pops so much on the white. The skirt and dress are cute, but I have to say, they can't compare to the pictures of your beautiful daughters, especially the last one where they're looking at each other–that is absolutely DARLING. DARN ME FOR PLACING AN ORDER WITH RIBBON RETREAT+FABRIC LITERALLY LIKE SEVEN MINUTES BEFORE SEEING THIS POST. I think it is safe to assume that I did NOT wind up with jumbo rickrack. However, I did get 5m of fabric and a bunch of hair accessory making hardware for just $60 so I'm still pretty puh-leased. So adorable! I love the little dress! I need to make one for my daughter. Great job! Eek! The cuteness overload! In a great way, of course! Love the jumbo ric-rac. Those girlies are so sweet and cute. How do you stand it?! Deelo Family – It's the Jumbo sized Ric-Rac. Dacia – Thanks for those links. I especially love the first one…..too cool! That is just too cute! I love ric-rac too! I LOOOOVE the dresses! They are perfect for spring/summer and super cute -as are your models! I too am wondering how you manage to get all these amazing projects done with little kids around -I have 3 and it seems like I rarely have the time (or energy) to do all the projects I want to try. 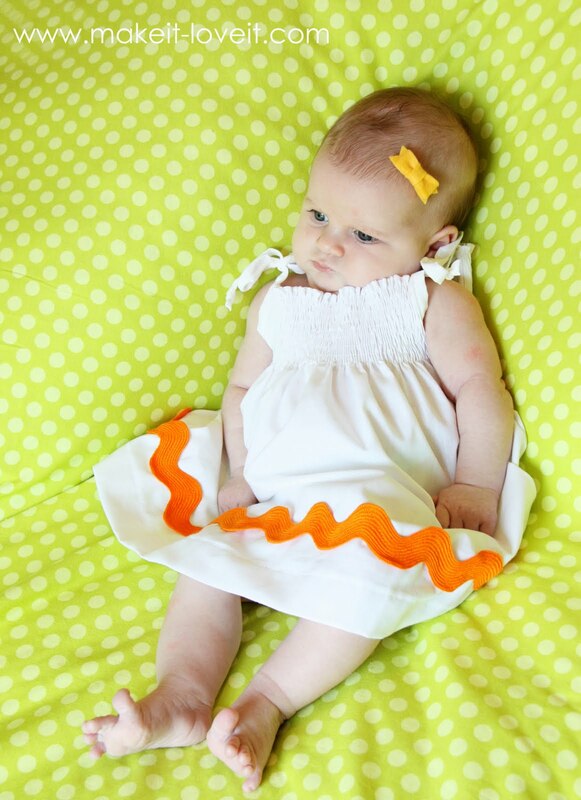 I think that little baby bottom needs an orange diaper cover (with white ruffles) to go with the dress! Very cute dresses. that ric rac is just awesome! and that dress and skirt are adorable! So fresh! I love the photo with your girls gazing at each other! Adorable…the outfits and the girls! Very cute. I like against the white too. So crisp for spring and summer. Very cute! I went through a phase where I put large ric rac on the hem of my skirts- I ove that stuff!! Great idea…cute, classic AND so easy to match to anything you need at the moment. LOVE IT! My problem with ric-rac is it curls up after washing…maybe it only happens to me. Thinking aloud here but maybe running two lines of stitching on top and bottom would prevent that…again, maybe the problem is me and not the ric race, lol! This has got to be one of the cutest ideas I've ever seen! You look like you are having so much fun with your girls! Enjoy! Thanks Ash! I used glue with Kayli so I don't think you're crazy:) I'll have to try it again with Kinley. I've just been doing headbands, but those single bows just look so precious on your sweetheart. Love ya! Love it! That ric-rac is so cute. Thanks for sharing! Hmmm….I just bought your pattern and am loving the embellishing ideas. I can’t wait to make my first one with no extras, and then bring on the variations baby! Even though I’ll be wearing the same skirt every week, nobody will know it because I can add different things to each of them. Ive noticed in a few of your pictures the bows or flowers on babies head are small and not on a headband or clip but somehow stuck in here hair…..I hope that made sense! I have a little girl with very litttle hair, how are you making these bows/flowers stay in?